100% safe for water use immediately. DIAGNOSIS: Requires treatment to control floating, submerged (chara) and microscopic (planktonic) algae blooms and odors. Options: 15 lb. 5 lb. Dosage: Treat with 2.5 lbs. to 4 lbs. of copper in 10-15 gallon mix with water. 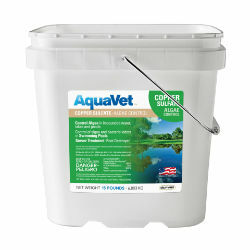 Dissolve completely and spray over the top of algae mats. See label for heavy algae blooms. DO NOT treat more than 1/4 to 1/3 of the surface area of the pond at one time to avoid Oxygen depletion due to vegetation death. Frequency: Treat promptly when algae is present. This type of treatment does not offer preventative control. Wait 7-10 days between treatments. Re-treatment during season will be needed.